This year has sped by and now we are either winding down to the New Year or winding up to the Holiday Season. I am never sure which. In November we hosted a ceramic glazing project as part of HCCC’s Hands on Houston where we met many budding young artists. We also had a sold-out workshop with Greg Reuter at HCC. Thanks to Greg for coming all the way from Corpus and thanks to Laura for arranging both. Our Members only show is up at the Silos through December 15, and well worth a visit. The fundraising committee has been busy with the final touches for our Bayou City Clay Crawl on December 2, 10:00 AM to 5:00 PM. I know you have had lots of e-mail reminders but it is our biggest fundraiser of the year so spread the word. This event helps to support our symposium and programs throughout the year. This year we have 10 Studios and 32 artists -- all inside the loop. The links that Ron created on our website will take you to information on each of the artists. BCCC will be a wonderful place to pick up those special holiday gifts so be sure to encourage friends and family to join the crawl. Great conversations and cocktails were had by many ClayHouston members during last nights Cultured Cocktail event at the Boheme Café and Wine Bar. My thanks to the many members who brought works for show and sale. Not only did we enjoy a great early holiday party we got lots of PR for the upcoming Bayou City Clay Crawl. Thank you Clara for making this happen. Wishing you all a wonderful Holiday Season and hope to see you on Sunday. P.S. If you’d like to be more involved, please contact me at info@clayhouston.org. 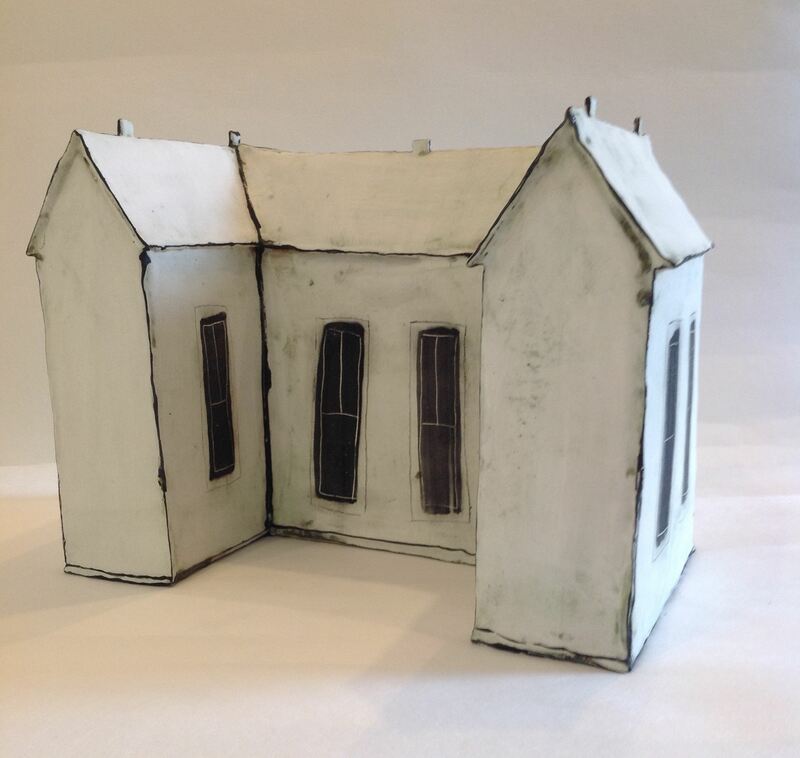 The Bayou City Clay Crawl showcases work from ClayHouston member artists and expands public awareness of ClayHouston’s membership and programming. Local ceramic artists open their studio doors for the day: Visitors can talk to the artists about their work, purchase art, and generally see how and where these artists work. This year, we have approximately 30 artists participating in ten studios across the city. Our artists make a variety of work, from traditional pottery to large-scale sculpture, installations, and performance art. We want every member to have the opportunity to be featured on the Member Spotlight. In order to be selected you must have a up-to-date profile page with at least 6-10 images of your work currently on display. 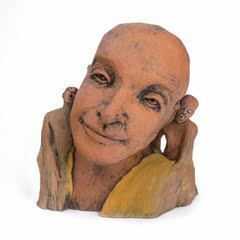 Eileen McClellan is pleased to announce that “I’m Listening”, an earthenware sculpture with underglaze, was selected by juror, Laura Rathe, for the VAA 36th Juried Membership Exhibition. The exhibit is at Silver Street Studios, West Wing, 2000 Edwards Street from November 14th through December 8th. 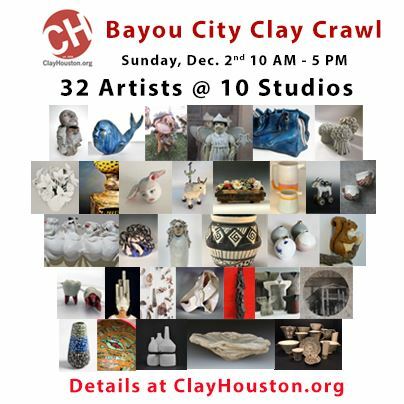 "Tres Ceramists" Michelle Matthews, Jodi Walsh and Ron Loyd will be hosting a weekend Studio Opening at Studio 4231, November 30, Dec 1 and participating in the ClayHouston Bayou Clay Crawl on Dec. 2. V. Chin, Saida Fagala, YuCha Pak, and Thomas Perry will be participating in the Heights Artisan Market holiday sale, December 8, 11 am - 7 pm, at All Saints Church Hall, 215 E. 10th Street in The Heights. Thank you to all who attended our Member Exhibition reception on Saturday October 20th, we had a great turnout! We were fortunate to have ceramic artist and UH professor, Anna Mayer, judge the entries in our exhibition. We're so pleased with the beautiful work in the exhibition, thank you all for participating! Helena Gijsbers van Wijk invites everyone to an exhibit of ceramic sculptures "Dire Circumstances". The show takes place at San Jacinto Community College Central Campus, 8060 Spencer Hwy, Pasadena, TX 77505, in the art gallery in McCollum East Building, parking lot P4. The artist's reception is on October 10, 5-8pm. Light refreshments will be provided. The exhibit runs from September 29, 2018 through January 6, 2019. Click Here to see what's happening now. Member driven bulletin board for buying, selling and trading ceramic needs. 200+ members have already joined our Facebook Group. Post and share artwork and your upcoming events. Check out our Sources at ClayHouston.org! Visual Arts Alliance announces the Wednesday, December 5th program from 6:00-7:00 PM: Sabine Street Studios Tour. Meet at Sabine Street Studios, 1907 Sabine Street, Houston, Texas 77007 and tour the newest addition to the Sawyer Yards Campus with resident artists from VAA.